Welcome to another “Say Something Sunday,” a day dedicated to personal Size Diversity activism. I’ve got some suggestions below and/or of course you can do your own thing. If you do participate, I’d love to hear about it in the comments (whether you do it on Sunday, or some other day!) 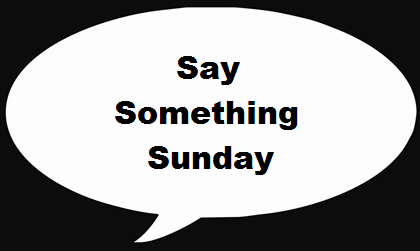 If you have ideas of things to do for Say Something Sunday I’d also love for you to share those in the comments. Decide to claim a space for body positivity – whether it’s your home, a group your part of (crafting, walking, game night whatever). Start to create a culture of body love where negative body talk is not tolerated. Write a thank you letter or e-mail to someone who helped you see and/or fight back against our culture of dieting and body hate. Speak up against “Good Fatty/Bad Fatty” messages that you see her hear. I do everything I can to keep my home a body positive space. Yep, same. It definitely starts with the home. I no longer allow the watching of shows that glorify weight loss and/or puts down others based on their appearance. Shows like “Biggest Loser” are definitely on the list of shows that are not welcome in my home, even though, once upon a time, it was a show that was regularly watched there. Also any body snarking or appearance based judgments spoken in my home are quickly called out. Yesterday I spoke out. There was a weight discussion in a group and someone said they were uncomfortable. A lot of messages apologized and then “explained” their position to the point that I felt they were telling this poor young woman her feelings were invalid. I commented and attempted (poorly) to say, hey group member here. Uncomfortable. Right/wrong appropriate/inappropriate doesn’t matter. She has let us know where her boundaries are. I think she deserves our respect. Let’s change the subject. I choose to measure the results of my exercise program by how it helps my health and NOT how it changes my looks! This is the week I’m supposed to meet with my psychiatrist with my food log. To say I haven’t been keeping up with it (its a ton of work as I’ve found out) is an understatement. Maybe I can consider not showing him what I eat like he wanted me to can be activism. Hope this helps but it has been proven time and time again but great research that what society considers beautiful is a learned behavior. Maybe even babies learn to think what is beautiful by how their mothers talk and think in the womb, It is why so many non western societies are not so homo-phobic and also it seems that it is natural that people would be attracted to “fat” (should be normal) people because they show strong survival tendencies than genetically thin people who clearly wouldn’t last one season of famine or disease outbreak. It is the western society based on our market system (ever been told socialism is bad? yeah thought so) that you constantly have to get other people to think you are beautiful based on the false construct of companies or people that are also trying to constantly hit you up for your hard earned money. The best example of this is Venus of Wilendorf which is a statue of the goddess of the Roman Goddess of love found of neolithic times which clearly shows that “excess” body fat (again another western construct) has been the absolutely most desirable trait since the dawn of human time, it really is no wonder that almost all artists up until about the 1950s valued body fat above all other notions of beauty. The bottom line on this is to feel great about yourself because if it weren’t for the false dichotomy placed by society the people who are “overweight” (“over” being another false construct) like us would be on the cover of Sports Illustrated and the thin people would be doing their best to overcome their genetics to be desirable. I am sick of people commenting on my ‘size.’ That isn’t so wrong. My body is mine. And I don’t care what you think about it. My weight shouldn’t matter because I am still the same person on the inside. Thank you for giving me this space to vent!! Simon – the food blog idea from your doctor is horrible. Just don’t do it. It is so invasive and so demeaning. Stay strong and I know you will get past this. I really look up to you. And if you can do it, so can I.
I’m a bit late, I know, but I was tempted to say something to my step-dad at dinner tonight when we were all chatting about a story his visiting daughter told us. I bit my tongue because I am a non-confrontational person who also has social anxiety. I reminded myself that it doesn’t matter what he thinks anyway and, besides, I try to not give my power away to others. Anyway, his daughter recalled a story about how, when her child was younger and threw a tantrum in a grocery store, a busybody woman riding a scooter criticized her parenting skills. His daughter added that the woman didn’t need the scooter but was just using it to get around. Step-dad asked if said nosy woman was heavy. WTF? Why does it matter if she was/is heavy? He asked the same question not too long ago about a different woman when talking with a relative via cell phone, if i remember correctly. I hope he’s not doing this deliberately in an attempt to be a jerk and it is more of a case of ignorance and a lack of critical thinking skills. I doubt he even knows what confirmation bias is, as I’ve tried to explain logical fallacies to the man before but he failed to grasp the concept — or at least seemed to do so.